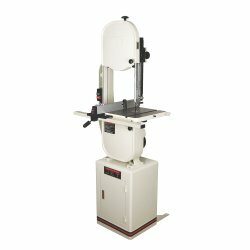 As its name suggests, this band saw is indeed a deluxe one; since it offers a high cutting deep capacity and fulfills multiple purposes for the user. An ultimate solution to wood and metal cutting, this band saw is highly versatile and strong. Read more to find out about the various features and properties that it has to offer. Made up of tough Cast Iron. This band saw has an extremely tough and rigid frame structure and overall body made up of cast iron. This material is known for its strength and the entire machine is so rigid and strong that it’s impossible for it to shake or be lifted up or down during operation. It has a HIGH blade speed. This band saw works at around 1500/3000 SFPM which is a very high speed making it one of the fastest working band saws in the markets that will provide you with an increased rate of performance. It is highly versatile and multipurpose. You can cut any material with it, be it wood or metal or plastic, and it has a high cutting capacity, allowing you to cut around a 13.5 inches wide and a 12 inches high plank with much ease. There is also an option for lowering or raising the blade level to allow for variable thicknesses to be laid underneath for cutting. It has a flexible table. The entire band saw is rigid as I said earlier and so is the table, but the best part of the table is its flexibility. The size of the table is 15 x 15 inches and it can tilt 10 degrees left and 45 degrees right, making it liable to be turned around and change its direction to whatever angle you require. There are present upper and lower ball bearing guides. This enables less friction to be reduced, thereby increasing the lifetime of the product and enhances the performance of the blade. There are two different speed options with a Poly-V belt drive system. A blade tracking window is present. A blade guide post with rack and pinion adjustment is there that provides better and precise cut. Comes with an enclosed stand with a handy storage shelf to keep your clutter in, as it comes out. This band saw comes with a 5 years warranty! It is very easy to set up, install and begin using this band saw. The blade tightening mechanism is a little complex and not very practical. The lower bearing guides cannot be accessed conveniently as it is placed at quite a lower position and is small in size. Vibrations are still felt in the structure of the band saw whilst it is in function. The Rip fence is not included at all! After going through the above lists and pointers, I will say that this particular band saw, the JET JWBS-14DXPRO 14-Inch Deluxe Pro Band Saw With Kit is an extremely tough and reliable band saw that will enhance your performance and bring a touch of style to your workplace at the same time; for its elegant and graceful look is a class apart. One of the ideal band saws best suited for individual and commercial use, this band saw is a highly recommended product to purchase.